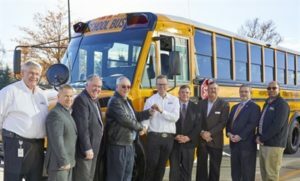 Thomas Built Buses Delivers First School Bus With DD5 Engine to Virginia Customer | Sonny Merryman Inc.
HENRICO, Va. — Thomas Built Buses recently delivered its first Saf-T-Liner C2 school bus equipped with the new Detroit DD5 engine to a Virginia school district. The Nov. 28 delivery comes one month after Thomas Built officially sold out of its 2018 allocation of DD5 engines. Onsite at Thomas Built Buses to accept the keys to the Saf-T-Liner C2 was Josh Davis the director of pupil transportation for Henrico County Public Schools, along with Floyd Merryman, president and CEO of school bus dealership Sonny Merryman Inc. The Detroit DD5 engine is a 5.1L engine adapted specifically for the Thomas Built Buses Saf-T-Liner C2. The engine is designed to increase fuel economy, which equates to more than money saved on fuel. The less diesel and DEF consumed means the aftertreatment system does not have as much to process, leading to fewer regens and improved reliability, as well as the longest service intervals in its class, according to Thomas Built Buses. The DD5, which was designed from a clean sheet, meets all the current emission requirements, according to the school bus manufacturer, and comes equipped with Detroit Connect Virtual Technician remote diagnostic service. Customers can order the DD5 for 2019 delivery by contacting their local Thomas Built Buses dealer. Story originally published with SchoolBusFleet.com.